ProstAware’s mission is to change the dialogue about prostate cancer and empower men to take control of their health. We bring prostate cancer awareness and education to men and their loved ones by tapping into the dynamic worlds of music, technology and sports. ProstAware’s goal is to engage men and their loved ones into meaningful discussions about prostate cancer. Since 2009, we’ve taken this fresh approach to creating awareness that starting at age 40 men should learn about the best approach for prostate cancer screening and survivorship based on their individual risks and health needs. Awareness, education, early detection and treatment are the keys to thrive and survive. Prominent Atlanta urologist Scott D. Miller, MD, is a men’s health expert who believes patients should be informed and involved in their care. He has been fighting prostate cancer in patients since he became a physician. When prostate cancer is discovered in an early stage – while still confined to the prostate – the five-year survival rate is 99 percent. That’s the driving force behind his passion for creating ProstAware in 2009 to generate increased awareness about the disease. Dr. Miller practices at WellStar Medical Group and is medical director of robotic surgery at WellStar North Fulton Hospital. A pioneer in his field, Dr. Miller performed Georgia’s first robotic prostate removal and has one of the largest, most diverse experiences in laparoscopic and robotic urology in the Southeast. 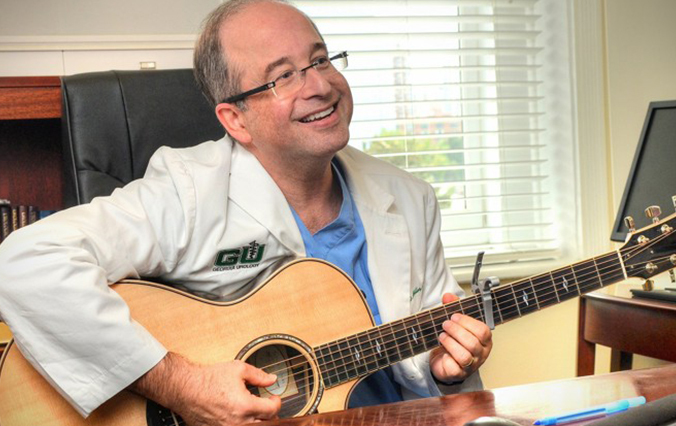 He is also an accomplished musician and composer who has written a variety of songs, including a one about the emotional impact of a cancer diagnosis. Tim Smith joined ProstAware in 2015 as Executive Director. As a prostate cancer survivor, he brings energy and passion to the organization to promote the importance of prostate cancer testing and the story of hope. Prior to joining ProstAware, he spent 25 years in the healthcare industry, leading teams in sales and sales management.